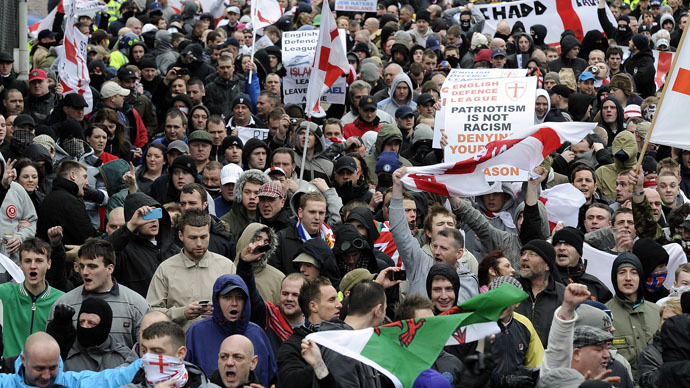 The far-right English Defence League (EDL) are planning to march against the building of a mosque in the English city of Dudley, prompting calls for a counter demonstration by campaigners and anti-fascists. The group, who are known for their marches against mosques, Islamic centers and what they deem ‘Islamic extremism,’ will gather on Saturday. On their official Facebook page, the group says the march is to protest against a mosque being built in the city. “Dudley is your average English town – nothing to make it stand out nationally – but that doesn’t stop it from being loved by the Black Country people who call it home,” an EDL spokesperson wrote. “Dudley has invited the EDL to support its struggle against another mosque – the town’s eighth. If we can help stop this mosque we will be helping protect a hometown and its families, a hometown like yours, families like yours,” they add. While the group still claims they are a human rights organization, many have accused them of violent disorder during their protests, which include attacking police, damaging public property and verbally abusing members of the public. The march is their first of 2015. Local police anticipate hundreds will attend the demonstration, taking place in a city where 11.5 percent of the population are from ethnic groups other than white British, according to the 2011 census. Community figures have condemned the planned march, including the Bishop of Dudley the Right Reverend Graham Usher. “I am deeply saddened that on Saturday we will yet again see members of the English Defence League using Dudley to try to divide and sow the seeds of distrust in our community,” he told the Express & Star newspaper. Trade union backed Unite Against Fascism (UAF) will hold a counter demonstration. The group claims the far right are using recent terror attacks in Paris to justify anti-Muslim sentiment. “The EDL is coming to Dudley to ferment hatred, division and stir up racism,” said Jerry Langford of the Black Country UAF. “We are Dudley, united against racism, and we will not give the EDL the freedom of our town,” he added.